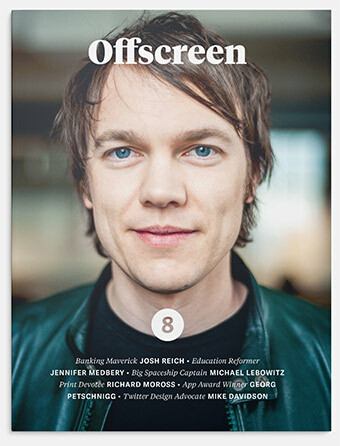 Offscreen magazine issue 8 is now available. I have an essay in this issue about the meaning of legacy in the digital age (with a beautiful illustration by Tom Froese). Offscreen is a high-quality print periodical with an in-depth look at the life and work of people that use the internet to be creative and build successful businesses. Ever wondered what goes on behind the scenes of the technology that makes your digital lifestyle possible? We invite you to turn off your device, grab a cup of coffee and meet their makers off screen. What that means is it’s an independent (one-man: Kai Brach) periodical, 150+ pages per issue, with gorgeous printing and paper stock, and strictly paper-only. It contains interviews, and introspective, medium-length essays about how technology and the web impact our personal lives. It’s a beautiful and luxurious product, and I’m delighted to have added to the almost 50,000 words in this issue. It’d look damned good on your coffee table, I bet. Issue 8 brings you conversations with Australian-born banking maverick Josh Reich; New Orleans-based ed-tech entrepreneur Jennifer Medbery; the founder of award-winning digital agency Big Spaceship, Michael Lebowitz; MOO.com creator and print devotee Richard Moross; trailblazing Paper and Pencil maker Georg Petschnigg; and Twitter’s Vice-President of Design, Mike Davidson. You can order copies and subscribe directly from the Offscreen site, and follow what’s happening via @offscreenmag on Twitter. You can also pick up a copy from these stockists in your country.